Weber Knapp’s Keyboard Platforms are designed to be ergonomically correct. 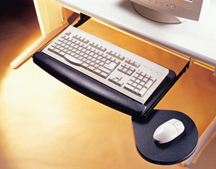 A revolutionary ergonomic concept to reduce fatigue by quickly changing from a seated to a standing position. Weber Knapp designs for a smarter workspace with ergonomic products.